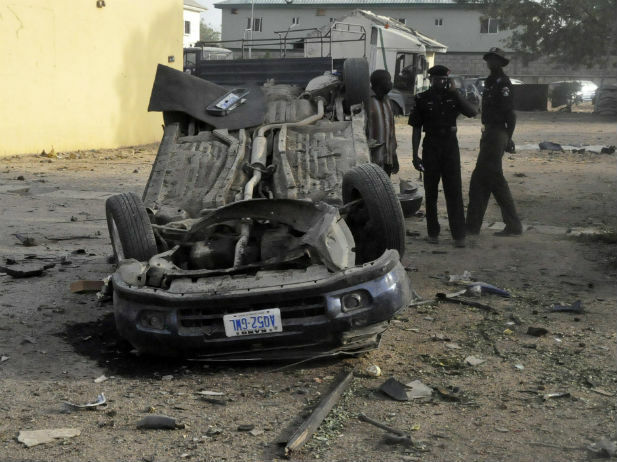 Police inspect a bombed car in Kano in 2012. Amid the media storm surrounding the kidnapped Nigerian schoolgirls, it is important to remember that just a couple of months ago that same media was celebrating Nigeria’s stellar growth performance and investment potential. Despite lingering structural problems, Nigeria has emerged from the disastrous years of the 1980s and 90s with renewed gusto. High oil prices, improved economic diversification and a massive consumer market estimated at 170 million people have been turning the heads of foreign investors. After a decade of growth averaging 7% annually, Nigeria has been promoted into the select ranks of the MINTs, a newer, edgier club of emerging markets that have caught the attention of investors disappointed by the lacklustre performance of the BRICs in recent years. The MINT countries (Mexico, Indonesia, Nigeria and Turkey) are distinguished by high growth rates and large young populations, where unresolved problems of instability, infrastructure and corruption create a heady mix of dynamic potential and volatility that offer enticing possibilities of high-risk high-return investment. Barely a month ago, the rebasing of Nigeria’s economy added lustre to the image of the country as an investment opportunity by nearly doubling the estimated size of the economy. Nigeria has officially surpassed South Africa to become Africa’s largest economy as well as the continent’s most populous nation. The outpouring of investor enthusiasm has been expressed in comments about booming sales of luxury cars and Champagne, and observations about Nigeria’s impressive market potential in everything from name-brand clothing to education. Yet this same Nigeria is now a poster child for Islamic terrorism, inept governance, kidnapping and mayhem. In just over a month, Boko Haram has kidnapped and held over two hundred school girls, bombed the same neighbourhood in the nation’s capital Abuja not once but twice killing and maiming scores of bystanders, blown up bridges in the north-eastern states, burned two towns to the ground slaughtering hundreds in the process, bombed the northern commercial cities of Kano and Jos, and committed numerous other less dramatic acts of terrorism and destruction that haven’t made the international news. What is even more alarming is that events like this have been going on for five years across the northern states of Nigeria. Drive-by shootings, suicide bombings and coordinated attacks on police stations, churches, mosques, schools, beer parlours and even the UN Headquarters in Abuja have taken the lives of at least 10,000 people since 2009, both Muslims and Christians alike. The current narrative is that Boko Haram is the product of a destructive cycle of poverty, illiteracy and extremist Islamic values in the north of the country. The Economist has highlighted the astonishing levels of social and educational deprivation in the north-eastern Nigerian heartland of Boko Haram, where barely 20% of women can read and write, something Boko Haram seems set to perpetuate. It is difficult to reconcile the image of dynamic MINT economies with this dire scenario of poverty and mayhem. Yet proponents of the MINTs contend that investment and creative entrepreneurship can turn Nigeria’s unruly young population from a threat into an opportunity. Global economic engagement with Nigeria’s vast labour force and consumer markets promise to replace poverty and terrorism with job creation and consumer satisfaction. But this new found attractiveness to global investors may be part of the problem rather than part of the solution. The long years of punishing economic restructuring have brought a recovery riven with inequality. Despite robust growth performance, poverty has actually increased from 52% of the population living on less than US$1 per day in 2004 to 61% in 2010. While investors focus on expanding markets for champagne and luxury cars among Nigerian elites, little of this exuberant growth is trickling down. Instead, decades of public sector downsizing and de-industrialization have trapped the bulk of the population in a world of collapsing services, physical insecurity and jobless growth. Unemployment figures have nearly doubled since 2000, reaching 24% by 2012. A meaningful focus on job creation in a country the size of Nigeria requires more than shopping malls and vocational training. With a young population still growing at 2.8% per year, Nigeria is confronting a demographic tsunami that puts 1.8 million new entrants into the job market every year. The pressures of restructuring and globalization that have made Nigeria so attractive to global investors have exacerbated rather than eased long-standing patterns of regional inequality. A history of educational disadvantage in the Muslim north has left the population poorly equipped to seize the new opportunities created by Nigeria’s economic resurgence. This is as much a legacy of colonial policy, which kept Western mission schools out of northern Nigeria, as it is a product of any Islamic resistance to Western education. To make matters worse, the northern Nigerian economy has been particularly hard hit by global economic restructuring. In the post-independence period, economic opportunity in the educationally disadvantaged northern states was dominated by agriculture and formal sector employment, both of which have declined dramatically over the past two decades. Pressures of high population growth, recurrent drought and a lack of investment in small-scale farming have undermined the agricultural economy, haemorrhaging youth into the urban centres. At the same time, the North’s urban economy has been gutted by deindustrialization and reduction in public employment. The textile industry, once the nation’s largest industrial employer, was concentrated in the northern states of Kano and Kaduna. Decaying infrastructure and import competition has reduced the number of textile and garment firms from 175 in the mid-1990s to fewer than 25 in 2010, with a loss of over 110,000 jobs, with little to replace them beyond chancing it in a saturated informal economy. By contrast, the Nigerian south-west has been better placed to benefit from the opportunities of a globalizing economy. Historically higher levels of education and a more diversified economic base have fostered more successful engagement with Nigeria’s emerging service economy in banking, telecommunications and entertainment. This has resulted in massive regional inequality in the gains of globalization. Unemployment in the northern states is three times the levels in the south-west of the country. Poverty levels in the north are 40% higher than those in the southwest. The problem has less to do with Islamic attitudes to education than deeper dynamics of historical marginalization. At least half of the population of the booming south-western states are Muslim. Conversely, many educated youth in northern Nigeria struggle to find work in the collapsing northern economy. In the once vibrant northern cities of Kano and Kaduna, young men with post-secondary qualifications can be found working as load carriers and hawkers. There is a simmering sense of frustration and resentment as polished graduates from elite schools snap up the few available jobs while leaving even comparatively educated northern youth to fend for themselves in demeaning informal activities. This does not turn unemployed and under-employed northerners into terrorists – quite the contrary, the northern Nigerian informal economy has been a resilient sphere of inter-religious solidarity – but it unleashes dynamics of exclusion, rage and desperation that have pushed a few over the edge. In a recent interview, the Nigerian Finance Minister, Ngozi Okonjo-Iweala, insisted on the need to change the narrative if we are to understand Nigeria’s current plight. The dignified campaign of Nigerian civil society to “˜bring back out girls’ has triggered an internal debate about whether the narrative should revolve around girls’ education or untenable governance failures. At the global level, the depredations of Boko Haram have challenged other framings of Nigerian development. In particular, it highlights the need to rethink the MINT narrative of high-return investment and developmental impact. The vision of a Nigerian investor’s paradise focuses attention on the easy pickings, concentrating investment and state attention on the people and parts of the country that can afford new consumer lifestyles, rather than on those who can’t. In the process, structural tensions and social divisions are reduced to risk calculations, without much consideration about who will ultimately bear those risks. The kidnapped Chibok school girls are a sobering reminder that when high return investment engages with developing countries still plagued by structural problems of corruption and instability, sometimes the risks are the only thing that trickles down. Kate Meagher is an Associate Professor at the London School of Economics. The Abduction of Innocent young [female] students and Boko Haram and the Cult of Gangsterism is indeed the “new face of terror” impaling select regions of Africa with intense anti-intellectual vigour. I’m not sure I get the point of the author’s argument. Why must any country’s narrative be a singular one. Nigeria’s reality — like many parts of Africa — is one of paradox: the investment attractiveness is just as real as the socio-economic imbalances. Neither is more real than the other . I’m not arguing that this is right or that this is how it should be but I fail to see the value of the argument that: “…this new found attractiveness to global investors may be part of the problem rather than part of the solution.” Really? You genuinely believe this or is this part of an ideological mindset distant from reality? It is all too easy to show off some parts of Lagos, Abuja or Port Harcourt and pretend that they are representative of the whole country while people in most other regions are living in squalor and extreme poverty. This attitude only succeeds in deepening existing divisions and causing more mayhem in places like the North. Obviously, this pretense cannot be sustained and the Boko Haram crisis is only a reflection of what happens when large sections of the economy are grossly ignored.